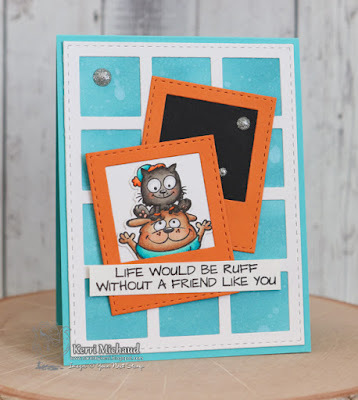 Your Next Stamp Fun Friday Challenge #107! Hello! 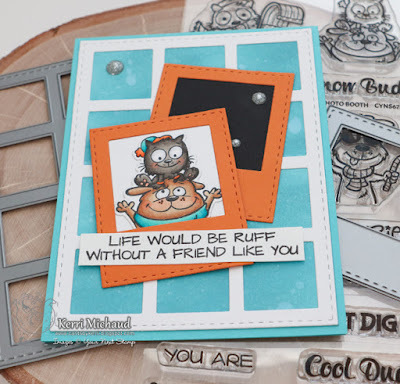 It's time for a new Fun Friday Challenge at Your Next Stamp and this time we want you to include Die Cut Shapes on your card! For my card, I used the super adorable Holiday Photo Booth Stamp Set along with the Photo Booth Polaroid Die. I stamped my image with Black Olive Ink and colored with Copics. I then cut it out with the coordinating Holiday Photo Booth Die Set. I adhered it to my frame cut with the Photo Booth Polaroid Die and then cut out another frame and added an empty black background. For my background, I sponged a piece of white cs with Broken China Distress Oxide Ink and spritzed with water. I then layered a white panel over the top that was cut with the So Many Squares Panel Die. I added the sentiment and then some Bling It On Sparkly Gumdrops and it was complete! I have this stamp set and LOVE it! Your card looks fantastic! I love your colouring and design!